For now, I'm going to take a break from Sharon CT Daily Photo. I don't know if that break will be for a day, a week or forever; if I'll post occasionally or return to daily posting. I'm doing it for a number of reasons, but one is that for the last many months I've been "phoning it in," as my favorite high school English teacher used to say. Last year, I took dozens of pictures I was really proud and pleased about, and I was able to take the time to search out beautiful new scenes and photograph them at just the right time of day or from just the right point of view. That hasn't been possible for quite some time, and I don't want to post mediocre pictures, repeat myself, nor fill out a meager offering with pictures from my garden or family, as as that's not what this should be about. So for now, a break, a rest, some time to regroup and rethink. I appreciate all the wonderful comments, support, suggestions, critiques, and the many silent visits each day as well. Thank you, and see you soon, in one way or another! 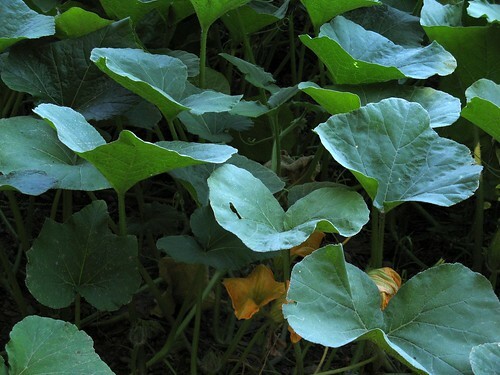 I leave you with this: a photo of a pumpkin vine, not from Sharon but from a weekend excursion to a friend's house near Germantown, NY, to pick blackberries. Well, dang! Hope you do post, at least some. What a great title to this post. Hope it's not forever and that you'll soon get the opportunity to find some more photos to enthrall us with. I hope you still visit! Just recently found your blog. I'll miss it. We are in the process of moving from Philadelphia to Sharon, and your lovely photographs and cheerful posts have confirmed how fortunate we will be. It is such a lovely area. Perhaps we will meet soon, on line or in person. Very sad - as a displaced new englander, your site has been a daily connection to home for many months now. But I can certainly understand the ongoing challenge of blogging, especially when there are few tangible rewards - partly because people like myself visit and appreciate, but leave in silence. I selfishly hope you will soon be re-bitten by the photo blogging bug, but if not, thanks for all you've done. I tried to leave a comment the other day but it wouldn't work. Just wanted to say I'll miss you - I check almost every day and always love what you post. Hope you come back soon. (thats my attempt to draw teardrops.) I hope you get a good rest, get the kids off to school in the coming weeks, and hopefully come back when the time is right for YOU. As a true Sharonite, you made us all very proud with your showing the world just some of our little piece of heaven thru the lens of your camera. You truly are an artist with a camera, and a very good one at that. I am the last person qualified to scream at you for doing this, aren't I? The thing is, you are driving this bus. We've seen a lot ofour friends from '06 take that breather, often for the same reasons. It is possible to get jaded, but in the process you truly have put Sharon, CT on the map and I am grateful that through that, I know you and we have transcended the mere blogworld. I would offer you just this one suggestion. Instead of being tied to the daily obligation, you could try the flexilibity of a purely photo-blog, that is, you shooting whatever, wherever, whenever. Because you love to work with the camera, perhaps this could bring you new, greater fulfilment? You would be free from chronicling just Sharon & environs. But in the meantime, take the break, recharge, sing!!! And don't lose that camera! The pumpkin vine is fitting. You never know what is at the end. So like your exodus, the end might be a blessing. Have a nice time. I am about there myself. My carpal tunnel syndrome is bothering me. I'm disappointed that you have stopped posting to your photo blog. As a neighbor from "down the road," in Washington, CT, I take special pleasure in seeing what another photographer sees in my neighborhood. If new local shoo0ting sites might spur your return to posting, stop by my blog ((http://rothphotos.blogspot.com) or stop by the live exhibition I'm putting on with friends (info at http://the-cameras-eye.blogspot.com/). There's plenty more worth shooting right on our doorstep. I will truly miss your site. As a person who left Sharon 42 years ago, visiting your site has brought back so many memories. Best to you, and enjoy time with your family. Jenny, Hope your break gives you time to recharge and brings you happiness. Your images have always been among my favorites of the CDP'rs. You've touched a lot of people with your art, given us a sense of Sharon and its inhabitants, and opened our eyes to so much beauty. Thank you!